Vesicles are parts of cells which serve a variety of different functions. The function of vesicles are organelles, and the small enclosed sacs that comprise them can transport and store substances within a cell from one cell to another. They have a lipid bilayer, which separates the contents of the vesicle from the rest of the cell, from the cytoplasm and its contents. Vesicles can hold many different compounds, in either liquid or gas forms. Some of the functions of vesicles include secreting hormones, degrading worn-out cell parts, and regulating buoyancy. Vesicles are found in different kinds of cells, like archea, bacteria, and plant and animal cells. The vesicles found in these different cells have different functions, and one cell can have various types of vesicles, which have different roles. Some of the different forms of vesicles that animal and plant cells can have include vacuoles, transport vesicle, lysosomes, and secretory vesicles. Almost every cell in a plant has vacuoles, and vacuoles are also found in fungi and protists. Vacuoles can contain proteins, enzymes, amino acids, ions, and sugars. Vacuoles are also important for handling waste products. The waste products are enclosed by the vacuole and digested, broken down into its constituent parts so it can be recycled. The membrane that makes up the outer layer of the vacuole is dubbed the tonoplast, and it is important for helping the plant maintain turgor pressure. Turgor pressure is critical for plants, as without it the plant cannot maintain its posture. The tonoplast also assists in the regulation of ion concentrations in the cytoplasm, so it helps alter the pH of the cell. The vacuole needs a low pH to activate the enzymes that will degrade waste products. Until the waste products are degraded, they can harm the rest of the cell, so the vacuole protects other parts of the cell from damage. The number of vacuoles found within the cell, as well as the size of the vacuoles, vary depending on the cell’s needs. Animal vacuoles are frequently more numerous, as they play roles in endocytosis and exocytosis, the larger movements of the cell. Contractile vacuoles are subtypes of vacuoles that help regulate the amount of water and ions within a cell. This is especially true for cells which lack a cell wall. Vesicles are an integral part of the transport of materials. Vesicles often transport things from one part of the cell to another, and this is referred to as intracellular transport. As an example, while proteins are created by the endoplasmic reticulum, they are picked up by vesicles and move to the Golgi body or Golgi apparatus. When the transport vesicles have reached the inside of the Golgi network, the proteins that the vesicles carry get modified and sent out to the regions of the cell they are needed in. Their destination is determined based on sequences of amino acids. Some enzymes are brought to the lysosome while the other vesicles will end up fusing with the plasma membrane and delivering proteins to the membrane. Transport vesicles are also involved in the transportation of hydrophobic lipid parts through the cytoplasm. Secretory vesicles are created within the Golgi apparatus. These secretory vesicles carry compounds that need to be secreted, such as the carbohydrates and proteins that the extracellular matrix is made out of. This is also true of the hormones, enzymes, co-factors, and peptides that have effects in the environment outside of the cell. As an example, fibroblast cells release collagens and glycoproteins that are used by the cells to construct the extracellular matrix. Meanwhile, cartilage cells secrete proteoglycans and glycosaminoglycans while bone sells secrete matrix proteins and minerals. Lysosomes are tiny organelles found within the cells of animals. Lysosomes contain digestive enzymes which can fuse together with other structures and with the membrane. The vesicles function as digestive organelles. 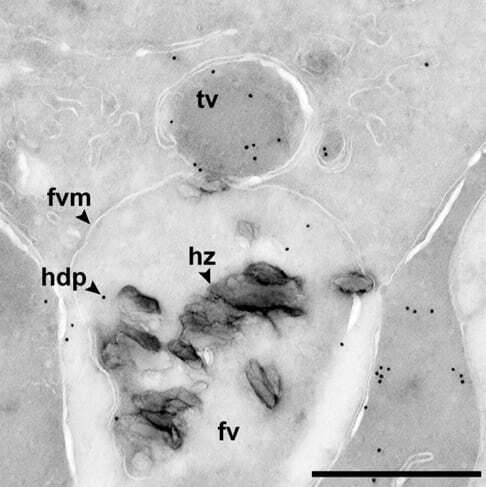 In single-celled organisms, lysosomes are capable of fusing with food vacuoles. Endocytic vesicles, which hold pathogens that have been isolated by the immune system, are also capable of fusing with lysosomes. Lysosomes have a wide variety of enzymes within them, which can break down many different macromolecules. They function when the pH of the lysosome is lower than that of the cytoplasm and can hydrolyze lipids, carbs, proteins and nucleic acids. The lysosome also has a mechanism which shields itself from its own degrading enzymes. The lysosome’s proteins are glycosylated – they have several sugar molecules which stave off the effects of the powerful digestive enzymes. If a lysosome accidentally breaks open, the cytoplasm’s neutral pH counteracts the enzymes and prevents damage from occurring to other organelles. Lysosomes are also involved in a cellular defense mechanism called phagocytosis. In phagocytosis, a pathogen is noticed and quarantined (engulfed) by a device dubbed a phagosome. The phagosome will then fuse with the lysosomes and the lysosome’s enzymes will destroy the potentially harmful microbe. Phagocytes called macrophages are part of the body’s immune system and can capture then digest various harmful compounds like pathogens, cancerous cells, and debris from dead cells. Phagocytes are a form of white blood cell. 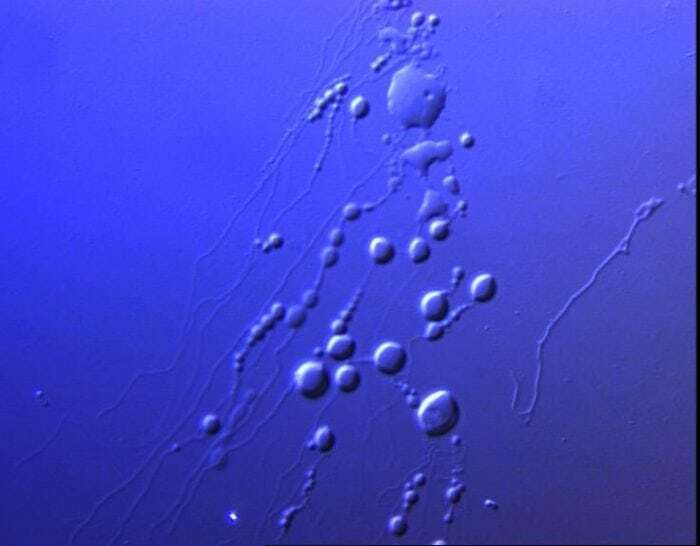 The extracellular vesicles are vesicles which can be found outside of regular cellular systems in eukaryotes, floating around within the extracellular fluid. Extracellular vesicles are found within the fluid because they are used to signal between cells. They also have large biopolymers and sometimes genetic material. They are also used in some aspects of cell development, regulating cell growth and cell death and breakdown (apoptosis). Lysosomes break down substances within cells and help eliminate harmful substances or pathogens. Vacuoles are responsible for maintaining turgor pressure in plant cells and isolating harmful materials from the rest of the cell. Transport vesicles are those which move needed materials and compounds from one part of the cell to another part of the cell. 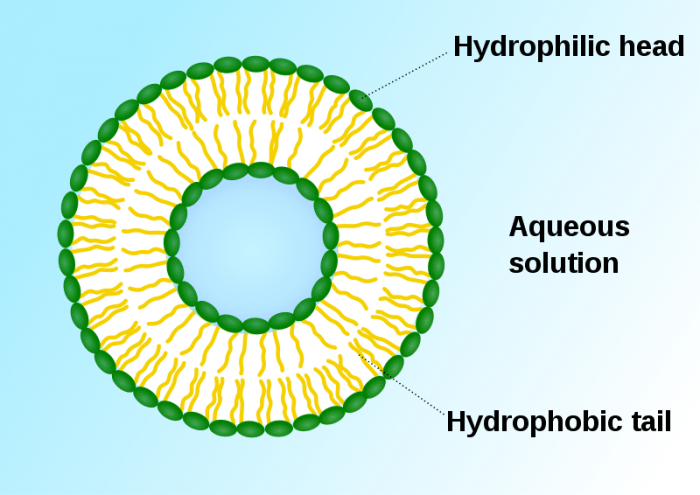 Secretory vesicles are vesicles that hold material which needs to be excreted from the cell, whether the material is hormones or enzymes for use in other parts of the body or waste products.